Olentangy Liberty’s Jack Barboza (19) tackles Toledo Whitmer’s Patrick Mappe (13) during the first half of Friday’s Division I regional championship in Findlay. Liberty’s Edward Warinner breaks up a pass during the first half of Friday’s Division I regional championship against Toledo Whitmer. 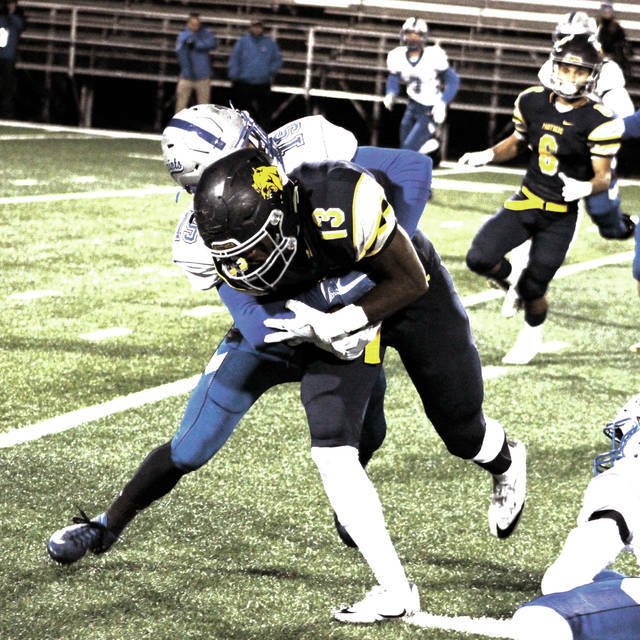 Mitchell Okuley tossed three touchdowns and Matthew Webb ran for two more as Olentangy Liberty ran away from Toledo Whitmer to win the Division I, Region 2 title Friday night at Donnell Stadium in Findlay. The Patriots (11-2) reach the state semifinal for the second straight season, though the road was not the same. Liberty was undefeated at this point last year. This time, the Patriots had to overcome a couple of early season non-league losses to Huber Heights Wayne (17-0 Sept. 1) and Pickerington North (42-0 Sept. 22). Webb made his impact on Liberty’s third possession. He broke a 62-yard run to set up his own 1-yard touchdown run to give the Patriots the lead with 5:00 left in the first quarter. Webb rushed for 156 yards on 23 carries, including 107 yards in the first quarter. He atoned for a fumble on Liberty’s second play from scrimmage that put the Patriots behind the eight-ball as Whitmer had it at Liberty’s 36. Fortunately for the Patriots, Troy Oehler stepped in front of a Riley Keller pass in the end zone to end Whitmer’s scoring threat. Okuley broke free and picked up 37 yards on a scramble to get the Patriots out of a 3rd-and-24 situation. Webb broke loose down the left sideline for 42 yards on the next play. The two long runs set up Jacob Sincek’s 6-yard touchdown reception from Okuley to give the Patriots a 14-0 lead with 0:31 left in the first quarter. Okuley’s 26-yard scramble in the second quarter set up Webb’s second touchdown – a 6-yard run up the gut — and Liberty had a 21-0 lead with 4:24 left in the half. Whitmer finally got moving on offense late in the first half. Keller found Patrick Mappe for a 28-yard touchdown on a fly route on fourth down to get the Panthers (12-1) on the board with 0:54 left in the half. Ben Roderick used his size to win a jump ball on a 52-yard touchdown reception on an Okuley pass off a flea-flicker with 0:46 left in the third to push the lead to 28-7. Okuley added his third touchdown pass on a 15-yard completion to Mitchell Kershner to cap the scoring. All told, Okuley threw for 142 yards, going 10-for-15. He added 92 yards rushing on 13 carries. Roderick was his top target, catching four passes for 96 yards. The Patriot defense held Whitmer to 139 total yards and just 10 yards on the ground on 29 attempts. 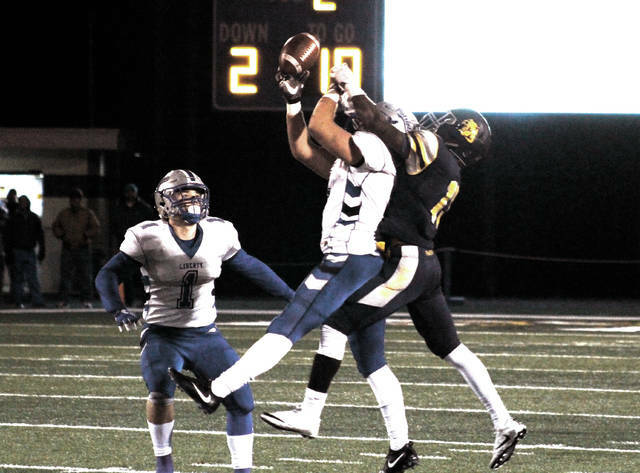 Lucas Campbell had an interception to end a Whitmer drive late in the fourth. Riley Keller went 13-for-25 for 129 yards through the air for the Panthers. Patrick Mappe caught six passes to lead all receivers and finished with 80 yards. “Some of the things that they’re good at is stuff that we take pride in stopping. We executed well,” senior linebacker Edward Warinner said. Liberty will play Mentor, a 23-21 winner over St. Ignatius, in next Friday’s state semifinal at a site to be determined. https://www.delgazette.com/wp-content/uploads/sites/40/2017/11/web1_tackle_cmyk.jpgOlentangy Liberty’s Jack Barboza (19) tackles Toledo Whitmer’s Patrick Mappe (13) during the first half of Friday’s Division I regional championship in Findlay. https://www.delgazette.com/wp-content/uploads/sites/40/2017/11/web1_pbu_cmyk.jpgLiberty’s Edward Warinner breaks up a pass during the first half of Friday’s Division I regional championship against Toledo Whitmer.